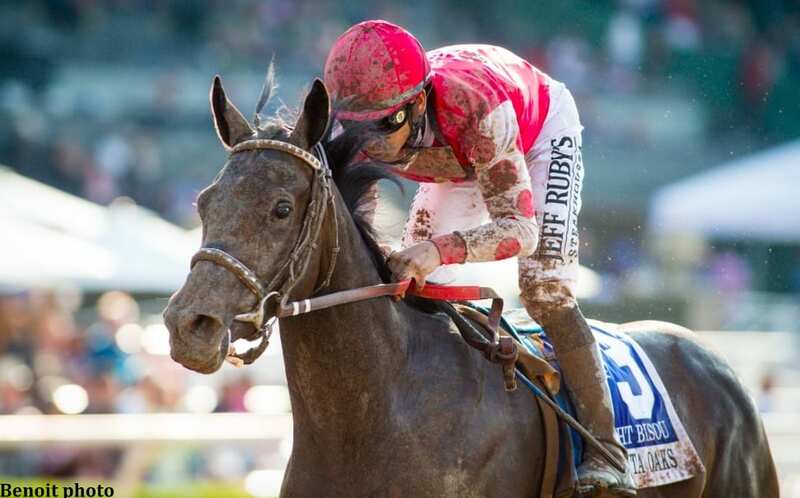 Madaket Stables LLC (Sol Kumin) has purchased a minority interest in G1 winner Midnight Bisou (Midnight Lute). She will run under the ownership of Bloom Racing Stable, Madaket Stables and Allen Racing LLC. Her three-year-old campaign is already stamped with 3 Graded Stakes victories in the G1 Santa Anita Oaks, G2 Santa Ynez and G3 Santa Ysabel, while under the care of trainer Bill Spawr. Midnight Bisou also placed 3rd in the G1 Kentucky Oaks despite a troubled trip. She will remain with trainer Steve Asmussen as she prepares for her East Coast campaign with immediate targets in the G2 Mother Goose at Belmont, followed by the G1 Alabama at Saratoga. Industry veteran Jeffrey Bloom has built one of the most successful national racing syndicates and his keen eye expertly selected Midnight Bisou, now one of the top fillies in the country, as an $80,000 two-year-old in training. Madaket Stables is run by Sol Kumin. Along with his other stables, he has obtained a record 36 stakes wins including 12 G1s, in the first half of 2018. This entry was posted in Bloodstock and tagged bloom racing stable, Jeffrey Bloom, madaket stables, midnight bisou, sol kumin by Press Release. Bookmark the permalink.